Pirelli has told Formula 1 teams that it is unlikely to make any major changes to the tyres for the remainder of this season, ahead of a meeting in Milan on Tuesday to discuss the situation. Senior chiefs from the Italian company are scheduled to get together for a long-planned debrief evaluating how its products have performed in the opening four grands prix, and to work out if any tweaks are needed. Although the majority of teams are happy with the more aggressive compound choices that Pirelli introduced this year, Red Bull has been outspoken in saying that it wants things to change. Speaking to AUTOSPORT ahead of the meeting, Pirelli motorsport director Paul Hembery said that any outfit hoping for a return to the more conservative compound choices of late 2012 would be disappointed. “There will likely only be very small tweaks, which will mainly involve changes to the operating ranges of some of the compounds,” he said. “We will try to not change too much. We will certainly not go to any extremes of making anything conservative. One of the aims of the meeting though is to ensure that the tyre choices are right for the remainder of the campaign, as track temperatures will not be as high as they were in Malaysia and Bahrain. “We are going to sit down and look at the first four races, to work out what we might have done differently if we came back again,” said Hembery. Pirelli tyres”And primarily, it is about what is coming up: because what worked in Bahrain might not work when we get to a cooler European season. “If we make changes we want to make them very early on and very quickly because we don’t want to be influencing the championship. 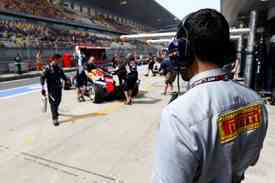 “But the approach will still be stimulating and leading to interesting races as we have had so far this year. “Having two to three stops is where we are at, and I am quite sure that Barcelona is going to be for a lot of teams a two-stop race, and Monaco will be a one-stop unless we find we have been quite aggressive and it is fun with a two.